An average hot desk costs $489 monthly. This chart from ValuePenguin shows that cash-short startups could save a significant amount of money if they turn to flexible working arrangements like co-working spaces which rent for an average of $489 monthly than operate in conventional office spaces in CBDs. 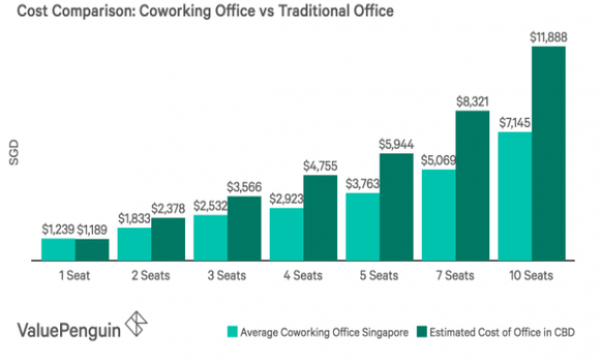 In fact, offices with ten seats post a glaring price difference as co-working spaces go for an average $7,145 whilst a CBD office is expected to cost $11,888. With office prices climbing 1.3% in Q1 as the property market kicks into high gear, businesses might want to consider flexible working packages as they usually come with utilities like electricity and high-speed internet as well as various networking opportunities from its diverse cast of members. 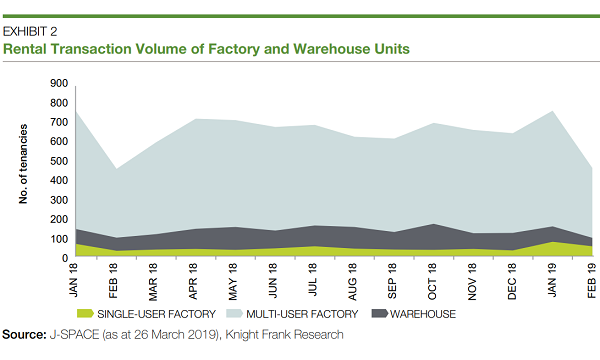 "Coworking spaces also tend to offer shorter minimum lease durations compared to traditional office leases," said William Hoffman, senior research analyst at ValuePenguin Singapore. "This gives startups added flexibility, which is helpful for those young companies that are unsure what type of office needs they will have in a few years." Singapore's flexible workspace market grew 17% to 228 centres offering co-working, flexible and hybrid office spaces, according to The Instant Group, with over 90% of flexible workspace hubs located in Central. However, local desk rates are still significantly lower than other key cities like Shanghai, Hong Kong, and New York.